If you’ve looked for an apartment or home to rent, you might have seen his ads on sites like Craigslist. Hundreds of people say companies run by Richard Rodriguez promised to find them a place to live, but only took their money. Authorities say he’s been scamming renters for years. State officials can’t seem to stop Rodriguez. Consumers have lodged nearly 200 complaints against Rodriguez rental companies with the Better Business Bureau, which the organization says is an unusually large number. But when the state closes down one of his rental agencies, he opens a new one, under a new name. Rodriguez is especially adept at evading both angry renters and enforcement agencies, said Phil Ihde, an enforcement agent with the California Department of Real Estate, who called him a “kingpin” of rental scams. In August the I-Team exposed how one of the biggest rental listing services in Southern California promised to find renters homes and apartments, but those clients say the agency took their money and didn t deliver. Now, Star Rentals has closed its doors in the wake of an NBC4 I-Team and state investigation. Joel Grover reports for the NBC4 News at 6 p.m. on Oct. 2, 2012. 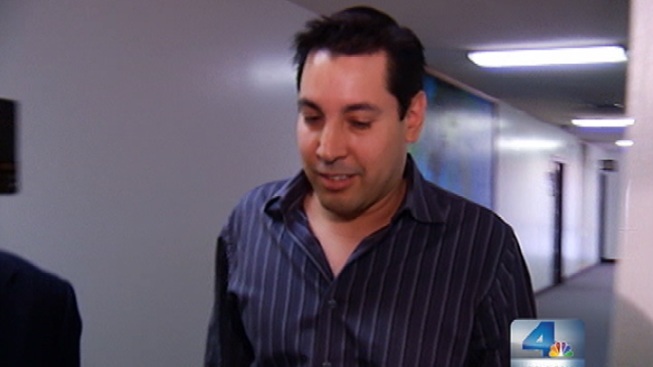 The NBC4 I-Team tracked down Rodriguez, and revealed how he stays ahead of the law. Rodriguez blankets sites like Craigslist, and classified papers like the Pennysaver with ads for apartments and homes to rent across southern California. When prospective renters call the number in the ad, a sales agent answers, and instructs callers to come to the office to pay a deposit, which the agent says is refundable if the service does not produce a suitable rental. Late last fall Sylvia Vidal signed up with International Home Rentals, which insiders say was run by Rodriguez. “They promised to find me a home. They did not deliver,” Vidal told the I-Team. International Home wouldn’t refund her $195 deposit, Vidal said. “It was right before Christmas, so I gave away my kid’s Christmas money,” Vidal said. Another prospective renter, Whitni Johnson, said she paid $195 to Global Rentals, which insiders say was run by Rodriguez. She, too, said the agency took her money and never delivered on its promise to find her an apartment. The state shut down El Monte-based Global Rentals in early 2012, for failing to provide customers with the services they paid for. Rodriguez then opened International Home Rentals, which the state ordered closed in July 2012, for the same reasons. In August, Rodriguez opened Hacienda Home Rentals. Johnson expressed her frustration that the culprits have continued to bilk prospective renters and evade punishment for their actions. How does Rodriguez get away with it? Authorities told the I-Team every time they shut down one of Rodriguez’ rental agencies, he opens a new one, by putting the license in someone else’s name. One person who agreed to have a license put in his name is Jason Rodriguez (no relation to Richard Rodriguez). Jason said that Rodriguez paid him $800 a month just to put his name on the state license for International Home Rentals. Rodriguez keeps a low profile, usually running his rental agencies from a back office, out of sight from customers and state officials. When the I-Team caught up with him at one of his rental agencies, and Rodriguez saw the NBC4 cameras, he ran down a hall and locked himself in an empty office. He came out an hour later and made a brief comment. “I haven’t opened any businesses,” he said. Rodriguez agreed to sit down and answer the I-Team’s questions the next day. When contacted by telephone, he declined to be interviewed and denied operating Global and International Home Rentals, saying he simply provided “marketing services” to those companies. After questioning by the I-Team, Ihde said the state will pursue aggressive action against Rodriguez. “We are working with our law enforcement partners to ensure that something does happen” to Rodriguez, Ihde said. To avoid getting scammed by a rental agency when looking for an apartment or home to rent, check them out with the Better Business Bureau (www.labbb.org). Prospective renters also run the name of an agency through many other consumer websites, like Yelp, which offer detailed comments about Rodriguez and his companies.